Male urinary incontinence is a common health problem affecting millions of men worldwide – different types of men, from many walks of life. Conveen Optima is Coloplast’s award-winning urisheath for men with urinary problems. Together Conveen Optima urisheath and Conveen Active urine bag completes the solution, for a reliable and discreet solution all day long. SpeediCath® Flex / SpeediCath® Flex Coudé Pro is the new soft catheter for men. Designed for easy, hygienic insertion, and practical disposal, it has a number of features that help make every step of catheterisation easy. SpeediCath® Compact Eve is the new stylish and discreet compact catheter for women. Designed for modern life it delivers one-step easy opening and secure reclosing. The triangular shape ensures easy handling and a better grip. The only compact all-in-one catheter and bag solution. SpeediCath Compact Set is the new compact and discreet catheter and bag solution that is instantly ready to use. The innovative award-winning design means the catheter can easily be kept in a pocket or handbag. Available in male and female versions. For women who self-catheterise, Coloplast has developed a convenient, discreet catheter, designed specifically for the female body. Less than half the size of a standard male catheter, SpeediCath Compact Male can be stored, carried, used and disposed of more discreetly. It can be inserted without touching the coated section. It comes ready to use – for even greater convenience and discretion. 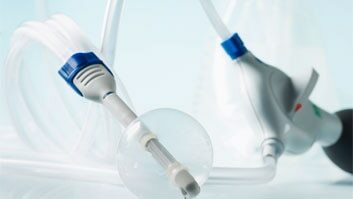 SpeediCath is a hydrophilic coated catheter that is pre-hydrated in saline water which offers the unique benefit of making it instantly ready to use with no waiting time. SpeediCath® Control can be used by anyone with a need to catheterise, it is specifically designed for male users with a need for extra control when inserting the catheter. The need for catheterisation sometimes presents challenges – particularly when you are away from home. That is why Coloplast has developed an all-in-one solution that makes catheterisation easy and safe no matter where you are. SpeediBag™ Compact is a discreet new urine bag for the female catheter SpeediCath® Compact. Together they provide a compact catheter and urine bag solution that can be used without transferring to a toilet. Now there is a way to get the predictability you want from your bowels. Peristeen® enables you to decide when and where you empty your bowels, giving you the ability to do more in your everyday life. you the confidence to do more in your everyday life. WheelMate gives you an instant overview of your nearest wheelchair-friendly toilets and parking spaces on an interactive map. It is powered by wheelchair users who add and verify every single location themselves, ensuring it works the way it should. It is easy and simple to use, and it is free!